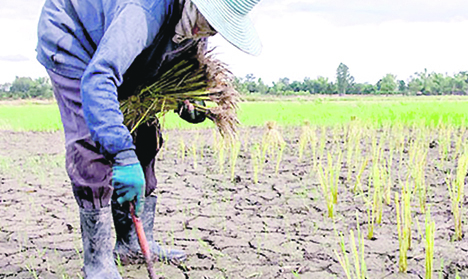 Cebu province was placed under a state of calamity Monday due to the damage done to crops by the dry spell brought about by the El Niño phenomenon. SEPULCHRAL SCENE. Sun-burnt patch of land in Cebu, which has been placed by authorities under a state of calamity Monday due to the effect of the weather phenomenon El Niño on all crops, with provincial officials approving a resolution declaring a state of calamity and immediately earmarking P59 million for the relief and assistance of affected farmers and fishermen. Damage to crops and marine resources is being assessed. The declaration, approved by the Cebu Provincial Board, will allow the use of emergency funds to help farmers affected by the dry spell. A statement issued by the provincial information office said Argao and Dalaguete towns were priority areas for assistance. The provincial government has allotted about P60 million as Quick Respond Fund this year to address the effects of the El Niño. Earlier, the Provincial Disaster Risk Reduction and Management Office recommended a declaration of a state of calamity, based on its province-wide assessment, which showed that 27 local government units reporting damage to crops and fishing. The weather bureau on Monday said “dry will become drier and wet will become wetter” as a result of global warming. In an interview, Analiza Solis, chief of the weather bureau’s Climate Information Monitoring and Prediction, said this would mean more powerful, though fewer typhoons. “Now, it has shortened to five to 10 years,” she added. The more extreme weather conditions would become the “new normal,” she said. “Last Sunday, water level dipped by .37 meters,” she told the Manila Standard. Business groups on Monday signified support to government efforts to solve water disruption in the east zone of Metro Manila within 150 days. The groups led by the Management Association of the Philippines said they were confident that the interim measures will resolve the shortage to bring immediate relief to consumers.